As a proud member of the Yoruba race, I am constantly on my toes in readiness to defend misconceived perceptions on issues that concern us. However, try as some of us might, there are those amongst us who seem bent on re-enforcing the belief many Nigerians already entertain; that the average Yoruba man is nothing but a noise maker. They claim there is nothing to us but hot air and that we are often prone to screaming blue murder when we lose out on anything from sports to politics. 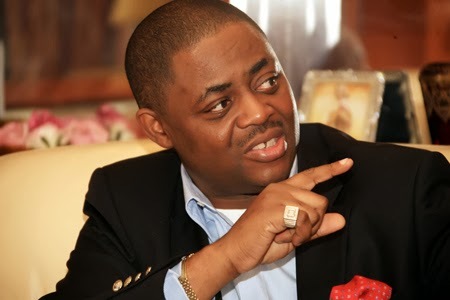 The self serving Femi Fani Kayode is one of such Yoruba personages who as a second generation beneficiary of the Yoruba large heartedness has preferred to further discredit and humiliate the rest of us rather than join the ranks of progressive and proactively inclined sons and daughters of the South-West towards the general good of the region and the country at large. Fani Kayode has become a source of embarrassment to many Yorubas through his insistent inflammatory remarks recorded on the pages of many of our national tabloids. From his vituperations on how he had in the past enjoyed close and might I add sexual relationships with Ibo women (some of whom he mentioned by name and most of whom are married) to his recent and callous criticism of the Minister of Aviation, Mrs. Stella Oduah, over the recent crash of the Associated Airlines plane which claimed about fourteen lives, I come to the conclusion that the man needs to be called to order and tutored on what it takes to be a social critic. Femi should be made to understand the basic etiquettes of public discourse. While we all bandy our rights to freedom of speech and all its privileges, I believe that those who have the love of country at heart should temper some decency I how we express our opinions. One does not have to resort to insults in the manner that has become habitual with Fani Kayode. Insulting people and criticizing their short comings are two different things and a reasonable man should be able to distinguish between the two. Clearly, Fani Kayode is not blessed with such a gift of discernment. His outbursts are often laced with such venom that betrays him for who he is; a man desperate for relevance and one who enjoys the sweet sensation of the klieg lights. Unfortunately, even though he seeks to adopt the posture of an activist fighting perceived enemies of the people through his misguided criticisms, Fani Kayode hardly ever postulates solutions. For this and nothing else, I believe the man should hide his head in shame and leave the Nigerian ‘talk space’ for those who have better things to say. I am no fan of Stella Oduah but her efforts in the aviation sector are evident for all to see. At least tax payers see evidence of their where their money is being spent. What can we then say about Fani Kayode’s stint as Minister of Aviation between 2006 -2007? For me, there is little or nothing to write home about. Nothing spectacular happened during his very, very short tenure (6 months) but here he is today bad mouthing the good deeds of the present administration. He is quick to boast or is it to gloat that during his inconsequential tenure that the nation did not record any plane crashes. I dare ask if it was solely due to his own efforts. I also want to know whether he deems that as an achievement worthy of mention. Furthermore, Fani Kayode should tell Nigerians what projects, policies and safety infrastructure he put in place as Minister of Aviation. It is public knowledge (unless he wishes to insult our collective intellect) that most of whatever he lays claims to as his achievements were already put in motion before his appointment. Nothing in all that he said belies the fact that he Nigerian Aviation Sector is safer than it ever was. Nothing in all that he said beclouds the fact that a strong wind of transformation is blowing across the sector. As a constant flier, i can attest to this. I quite agree with Mrs. Oduah that accidents are bound to happen. Whether on land, sea or in the air, we are all at the mercy of God. If Fani Kayode decides to join issues with Oduah simply because she said attributed the recent plane crash to the will of God. Perhaps Fani Kayode has forgotten the traditional prayer of travelling Nigerians: “O Lord grant us journey mercies”. When a mis-hap occurs along the way, is it not then the will of God? But for space and time, i would have sermonized on the story of Job in an attempt to enlighten the man on the nature of God and His relationship with the dark angel Lucifer. I sincerely do not think the Minister meant to be dubious with her use of words. Her statements are simply words of comfort to a mourning nation. God gives, God takes shikena. Of all that transpired in the wake of the crash, all the likes of Fani Kayode can do is to join issues with the Minister over a simple choice of words. If he had been Minister of Police Affairs or Inspector General of Police prior to 2003, the duo of the present Minister and IG would most probably have been at the receiving end of his lacerations over the Boko Haram saga. For those close to Fani Kayode, he must be made to realize the folly of his ways. He has been able to sustain an unenviable record as a clueless, offensive and arrogant man. All these shaken together and pressed down translate into an empty and broken vessel. If these traits have worked for him in his quest for recognition, i dare say it will not work for the Nigerian project of which we are all stakeholders. He should re-trace his steps. If he wants to contribute to nation building, he should do so in a more decent manner. For now, i see no patriotism in him and we can do without his opinions. Let me leave my egbon Femi with the immortal words of the great American President, Abraham Lincoln; “it is better to remain silent and be thought a fool than to open one’s mouth and remove all doubt”. The Paradigm supports an open discourse on a range of views. The opinions expressed in Op-Ed are solely those of each individual author and does not necessarily represents our editorial policy.